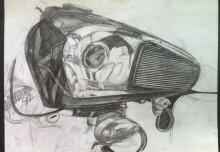 So here we are again, the countdown to the relaunch of the gallery is well and truly on. We are delighted to be operating out of the GalleryX premises on 65 South William Street, Dublin 2 and look forward to showing you around. Throughout the year GalleryX and ourselves will be putting on exhibitions alternately, so there will be a feast of art for your delectation in the course of 2017. It all kicks off for us with the exhibition “That Space In Between” by the amazing Shane Sutton on FRIDAY 12th May from 5-8pm, so mark it in your diaries and we hope to see you there. Please note the change of date from the last newsletter sent out. Although fans of The KEMP Gallery will be familiar with Shane Sutton’s work from the two pieces that he showed at our Christmas show last year, this will be his first full solo show in 7 years. The multi talented artist has done everything from film production to inventing a soft toy (Teddybos) and this has kept him away from the gallery environment for too long. We are delighted to have bagged him for this exhibition and are really excited to showcase the work on our relaunch night on May 12th. The body of work that makes up “That Space In Between” deals with what the artist himself describes as “that space after you leave but before you get there”. 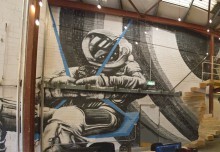 He continues with the theme of space and spacemen in particular from earlier work in his career. 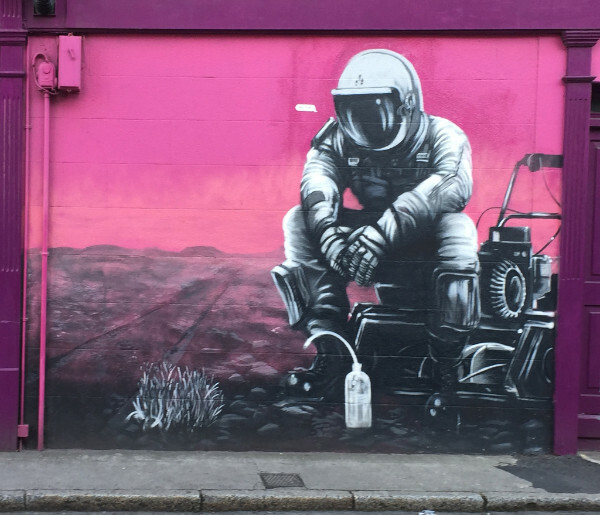 He has painted similarly styled pieces on the side of Busyfeet and Coco Cafe, also on South William Street and on Er Buchetto Cafe in Ranelagh (see image above). 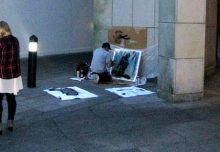 Shane invites the viewer to draw their own conclusions and fill in the blanks as he leaves the majority of his work faceless, the introduction of a personality is rare and is used as an emphasis of its absence elsewhere. He likes to to play with words in the titles of his pieces, such as “Immersion On” and “Alpha Bravo”, adding a sense of humour to his palette. Drinks on the night will be provided by Hope Beer, a brewery based in Howth. We are delighted to announce a partnership with them for all of our exhibitions in 2017. We thank them for their kind support and are looking forward to sharing the fun with them throughout the year. Watch this space for collaborations between Hope Beer and ourselves outside of the gallery environment. We look forward to seeing you on Friday the 12th May from 5-8pm. If you can’t make the opening, the new gallery hours are Wed-Sat 10am-5pm and the exhibition runs until Saturday June 10th.